Earth is reaching an uninhabitable state when dust storms plague the land, leaving food and other resources scarce, and the human race at the edge of extinction. As the situation reaches the pinnacle of its severity, former test pilot Cooper (Matthew McConaughey) is recruited by NASA professor Brand (Michael Caine) to lead the last resort - an expedition to a wormhole beside Saturn, which is the only hope in finding a new world to call home. Interstellar gives us more of the striking visuals Nolan is known for, especially now that he has branched out beyond his Batman trilogy, which remained grounded in a realism. 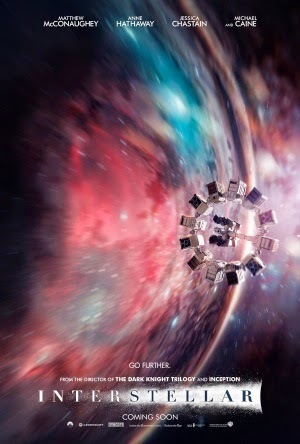 On the flipside, Interstellar embraces its outer space setting to develop a number of unique worlds, and beautiful portrayals of the void around Earth. The soundscape also pulls us into this experience - it may be far too noisy at times, drowning the character's speech, but when the sudden silence hits us as the Endurance spacecraft hovers through the Solar System, the gentle score really demonstrates a wonderful rendition of outer space. But at 169 minutes, Interstellar is a testing experience, and the run time is evident. The last hour or so of the film could've used a lot of trimming, and some of the supporting characters are completely pointless - without trying to spoil, I will simply say a smaller role by Matt Damon is wholly unnecessary, stretching the run time with no satisfying content. Nolan also tends to expend more effort into crafting a beautiful visual palette than he does telling a coherent story, failing to provide some essential backstory, and bragging about the films scientific accuracy - I know absolutely nothing about this stuff, but the characters spew out scientific jargon as if we understand it inside out. As a result, some conversations and plot points fail to make any sense to general viewers. But Interstellar still has its fair share of engaging twists, and a fantastic lineup of fine performances, particularly from McConaughey and Michael Caine, though perhaps less so from supporting protagonist Anne Hathaway. Nolan's screenplay also has some incredibly deep, moving moments - some of which almost had me in tears - and while many of the lines are superb, sometimes the themes and ideas of the film are painfully delivered in sentimental dialogue, which no normal person would ever say at the top of their head. It's difficult to critique Interstellar as it blends some fantastic moments with a lot of mediocre ones; and while it is likeable, it fails to fully live up to its incredible hype.